Typical spring weather on the coast has brought with it bouts of fresh, rainy weather. If you live in Squamish, the rain is no issue. It’s constant and it’s expected. Living in such a wet environment encourages you to become creative with your activities and hobbies! My boyfriend and I were given the opportunity, on a rainy Squamish Sunday, to become tourists in our hometown. 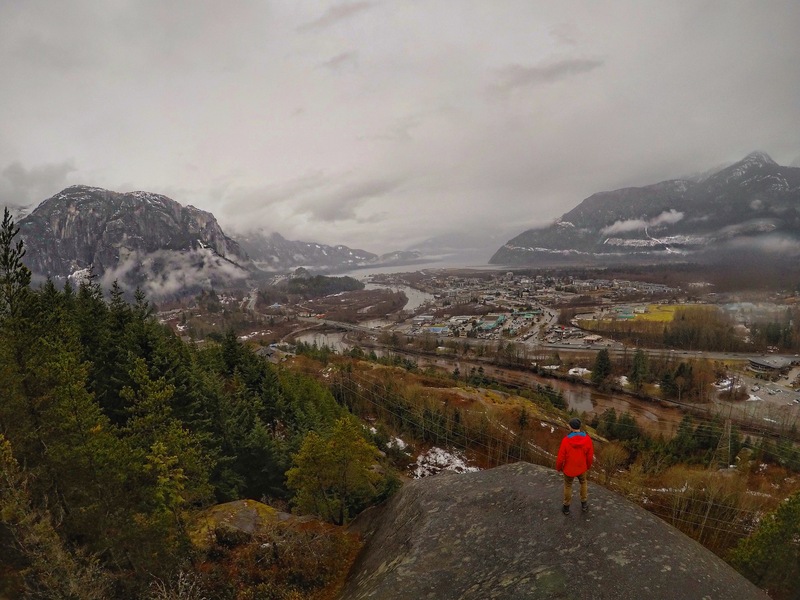 Along with the help of BC Transit and their #ExploreBCbybus initiative, we created an itinerary that would keep us moving and enjoying some of the in-town perks Squamish has to offer. 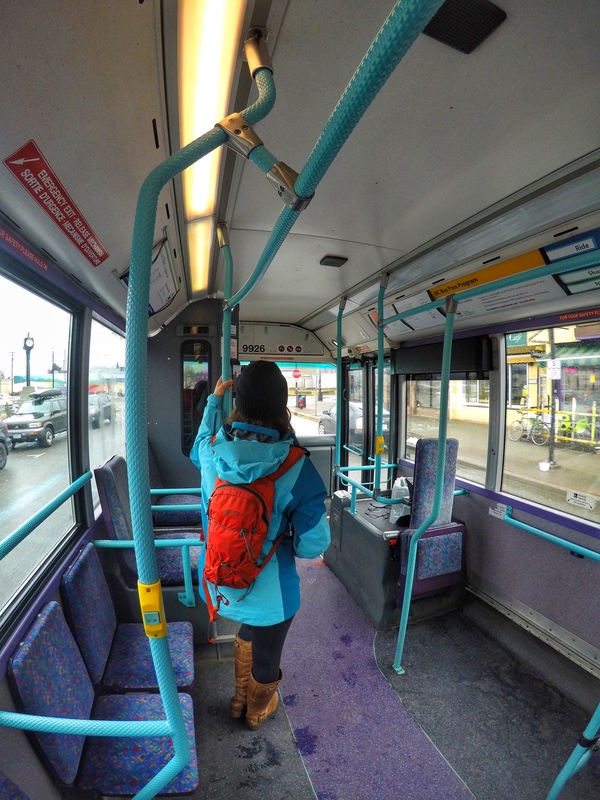 We started our day getting on the #3 Valleycliffe bus from Downtown Squamish – riding the bus in Squamish is an extremely pleasant experience. The stops are easy to find and the drivers are friendly and helpful. We hopped on at 10:04 and cruised through the Cleveland strip. The first trip was short as we got off just before Highway 99, at Eastbound Cleveland at Hunter. From there, we had a beautiful walk through Rose Park and continued on (about 8 minutes) to the Squamish Adventure Centre. I love visiting the Adventure Centre for my morning coffee. It’s a great place to get some work done and you can sit, facing out the large windows, at the magnificent Stawamus Chief. 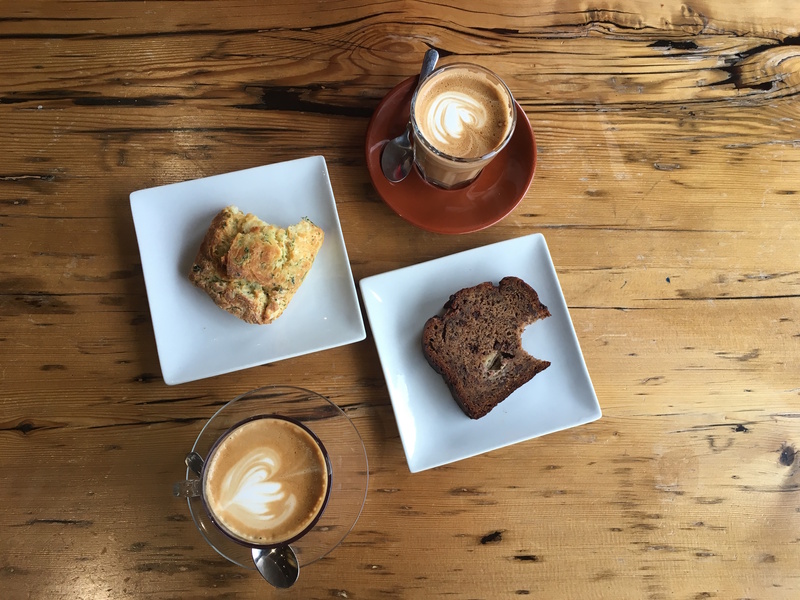 They have a great variety of baked goods and grab-and-go snacks. You can browse some Squamish history, visit the gift shop or ask the friendly staff for information on activities around town. After our breakfast and coffee, we continued walking down the trail adjacent to Loggers Lane – we arrived at the climbers’ parking entrance into Smoke Bluffs Park (roughly a 5 minute walk). I have spent a lot of time climbing, running and playing with my dog in this area. 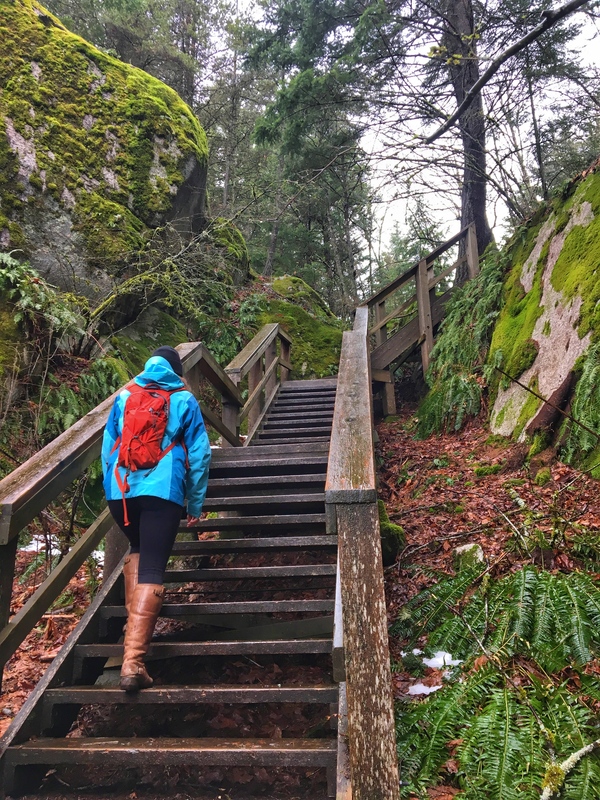 The Bluffs are not to be overlooked, a short hike will provide excellent views of Squamish and the surrounding mountains. Even on the greyest of days, you will find a picture perfect spot. In the late spring and summer you will find the park filled with excited climbers and visitors checking out the trails. Since we are both climbers, we spent some time admiring the routes and getting stoked for the upcoming season. 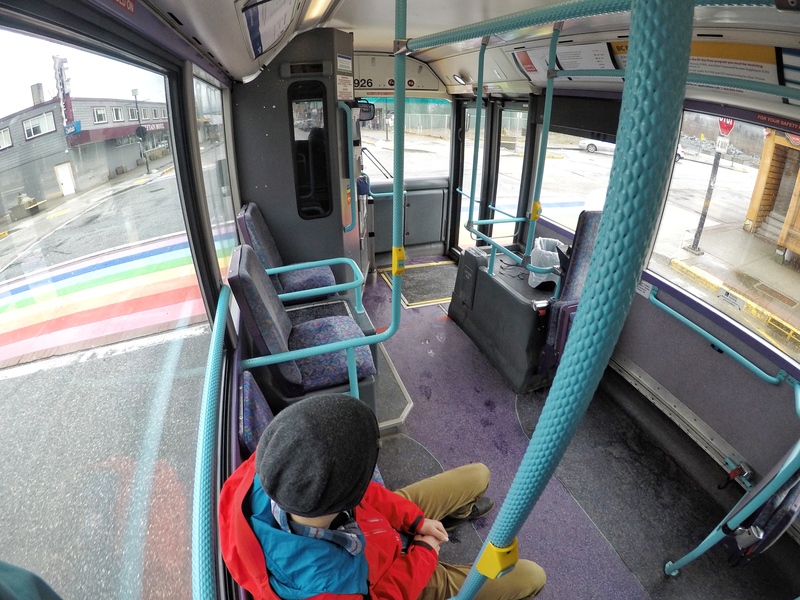 After looping a few trails and grabbing a few photos, we headed back down to catch the #1 Brackendale bus Northbound Queens at Commercial, to head for lunch! Again, the ride was smooth and we admired our small town as we turned down each street on our route. When we reached Brackendale, we offboarded at 41010 block on Government Road. Before heading into The Watershed Grill, we walked along the dyke near the Squamish River. 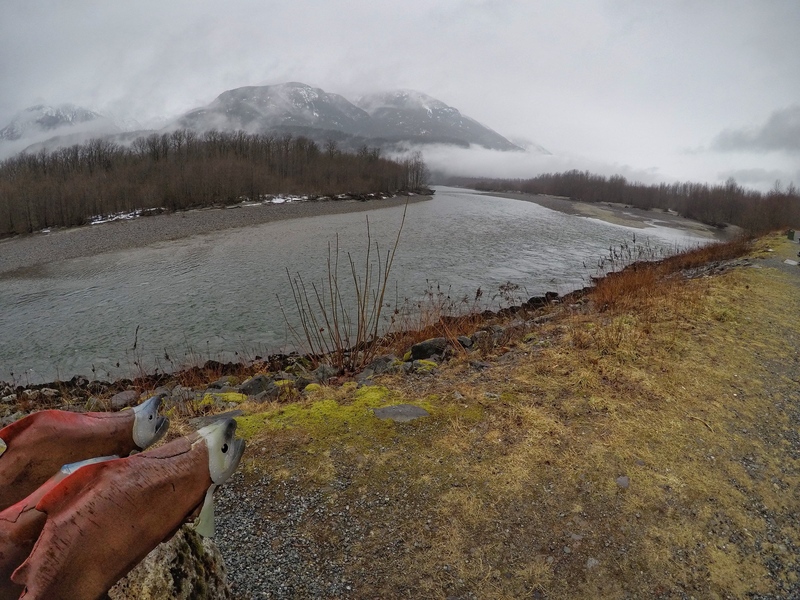 This is one of my favourite spots on a clear day because if you look left down the river you can see a clear view of the Chief mountain. In the fall, you will find groups of eagles perched happily in the trees on the opposite side. People travel from all over the world to eagle watch at this viewpoint. As the river rushed by, I took in the sights and smells of home: the fresh water, the slight hint of salmon in the air and the dampness of the forest floor. The Watershed Grill is a riverside restaurant with indoor and outdoor seating (in the summer months). 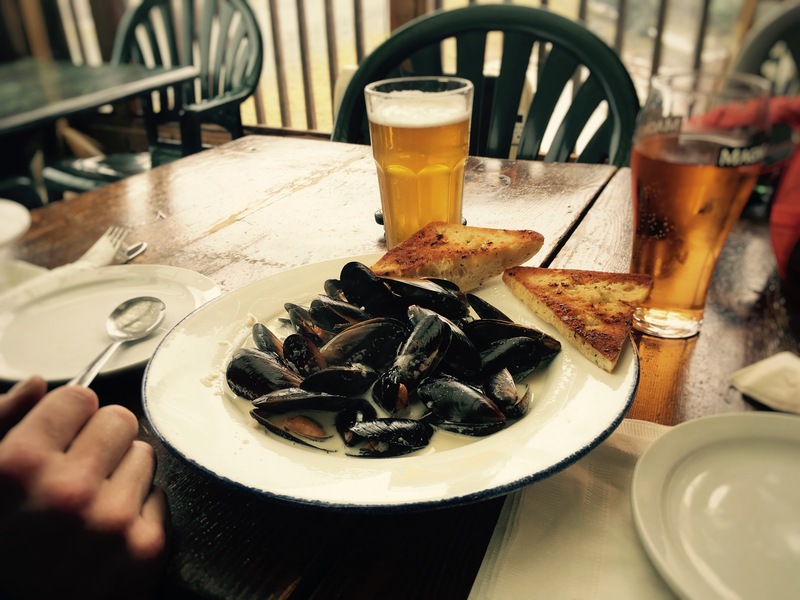 You can enjoy a variety of pub style food and some delicious seafood dishes. We shared the Blue Lip Steamed Mussels (in a creamy white wine & garlic broth – served with focaccia bread) and the California Burger (5 oz local chicken with no antibiotics & hormone free served with guacamole, melted brie & garlic mayo). It was the perfect lunch after our morning romping around in the rain. We enjoyed our meal as we listened to the pitter patter on the roof above our heads and the cozy atmosphere of the restaurant. Next stop on the list was to work off some of that food bouldering at the Ground Up Climbing Centre! We caught the #1 Brackendale bus Southbound at 41010 block Government Road. The Ground Up facility is an integral part of the climbing community here. The staff are helpful, friendly and open to giving advice and tips whenever needed. 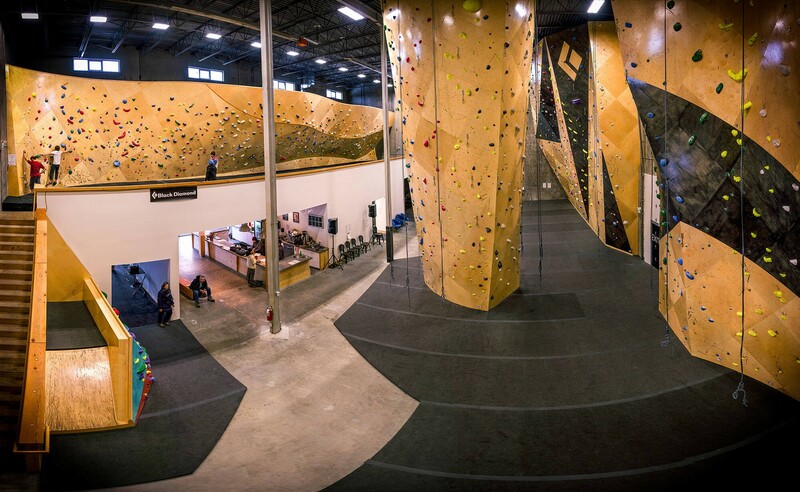 In this gym you will find 40-foot high climbing routes, a 100-foot long bouldering wall, training area with treadwall, gear shop, a cafe with delicious coffee and snacks as well as Physiotherapist, Dietitian, Climbing Coaches, and Trainers at your fingertips! The environment is chill and inviting for every level. 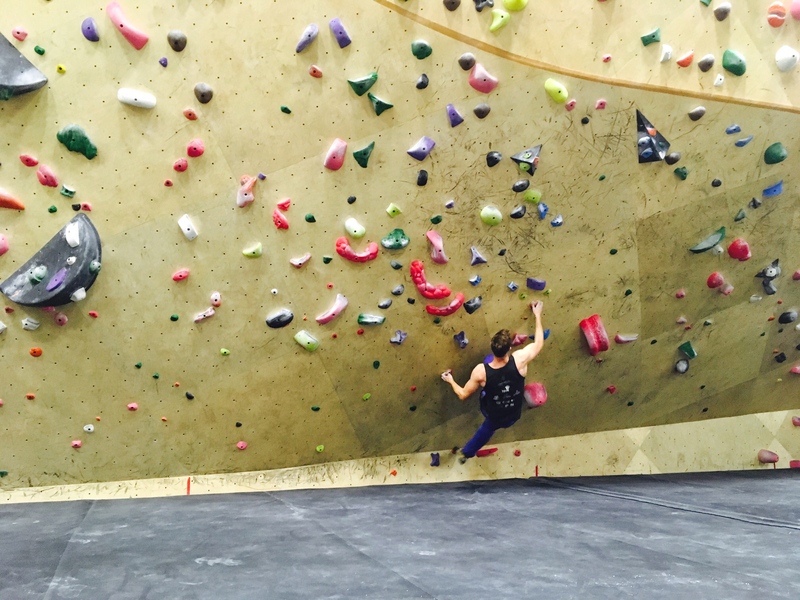 It’s a great place to enjoy some espresso, escape the rain and build up muscle, technique and endurance with climbing! We arrived in a short while and our food had settled enough to hop on some problems on the bouldering wall. Bouldering involves climbing without a rope. When you fall, you land on the large padded floor underneath. Bouldering is a great activity whether you are in a group or alone. If you are looking for something to do that will kill 30 minutes, or 3 hours, it’s the perfect activity. Problems are set up on the wall for all ages and difficulty levels. After our session we were ready to relax and enjoy a drink. The next bus to catch was the #1 once more for a ride down to Queens at Industrial. We got off here and headed into AFrame Brewing Co. They are situated in a small corner unit with windows surrounded the seating areas. You can hop up to the wood counter facing the bar or get cozy in the back corner for a longer stay – it’s very casual. 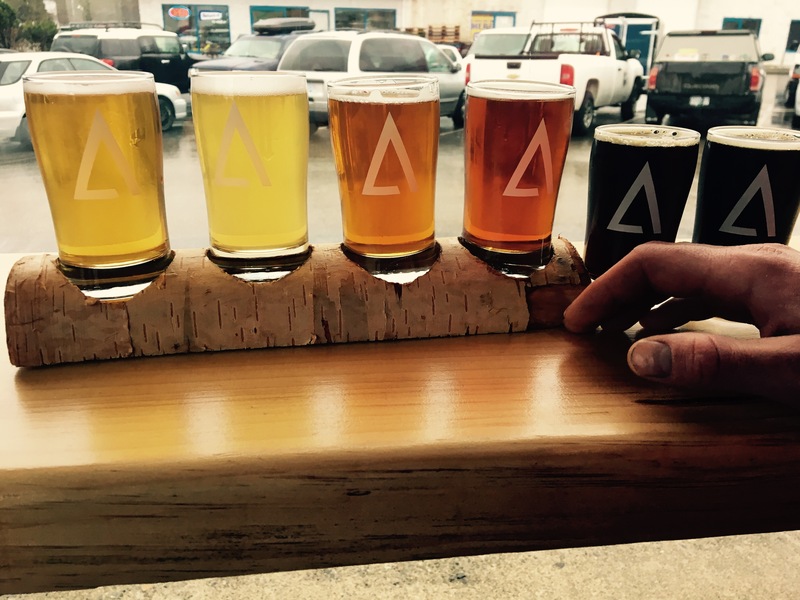 We ordered a flight and had a taste of each brew. Our last stop was for dinner. Caught the #4 bus to Second at Main and walked from there up to the restaurant. There are a ton of great dinner spots in Squamish but one at the top of my list is The Copper Coil Still & Grill. This small, intimate spot provides a menu of coastal flavours and locally sourced ingredients (meat is hormone and antibiotic free, and most comes from local, boutique farms). We had the Smoked wings to start (salt and pepper chicken wings cooked with a hint of bacon), followed by the Squash Kale Quinoa Salad (tossed in a citrus vinaigrette topped with feta, cranberries, apples, red onions and pumpkin seeds). After dinner we cheered our glasses to the day and all the places we were able to explore by bus! I haven’t taken much transit around my home but was thankful for the opportunity to try it and see how easy and affordable it is! I will be recommending transit to friends and family who visit our beautiful town.